I have the pleasure of introducing another guest blogger today. Nigel Wynne is a Senior Academic in Learning and Teaching within the Faculty of Health at Birmingham City University in the UK. In this article, he describes some of the very exciting work he and his colleagues are doing using Wonderland in a variety of health care related projects. It’s always struck me as slightly odd that many virtual world platforms divorce the user from the tools they use every day as they communicate, collaborate and work with colleagues. 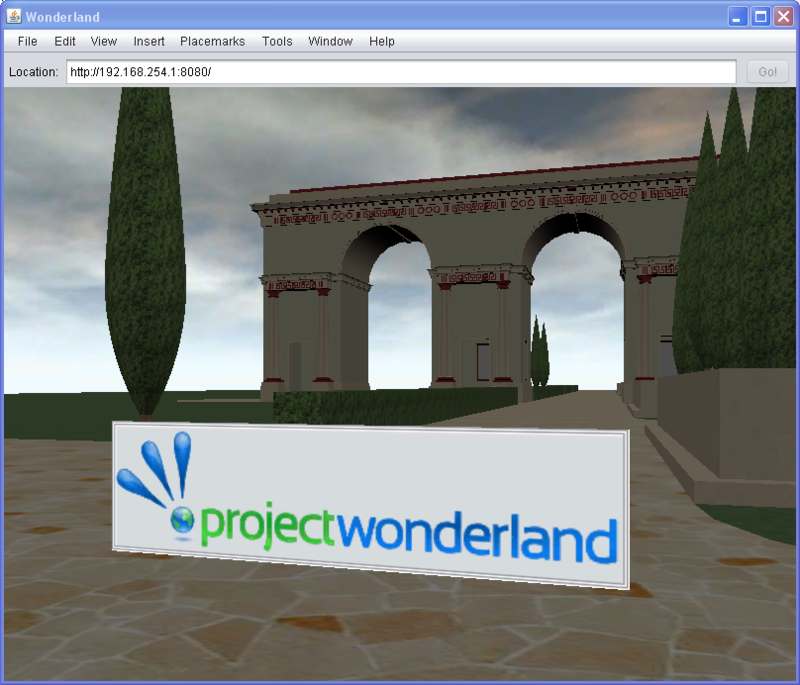 One of the strengths of Wonderland is its capacity to integrate real world tools within a virtual world setting. Staff within the Online Simulation and Immersive Education Research Group, Centre for Health and Social Care Research, at Birmingham City University, UK, are applying Wonderland in order to enhance Communication Skills Learning amongst learners preparing for work within the National Health Service. Following a nine month scoping exercise during which a range of virtual world platforms where explored in terms of their potential application to communication skills development, we decided that Wonderland could have a significant transformative impact in this area of our provision. Most of the unintended mortality and morbidity within the health sectors in the UK and USA have communication deficits as a contributing if not root cause. How then can Wonderland help to provide a more creative solution to what is a very real social imperative? Well, when we break down communication we get three rough subsets: verbal, non-verbal, and written components. Verbal communication within Wonderland is enhanced by its support of 3D immersive audio. Here, for example, learners are aware of the direction from which verbal communications and sounds emanate and may be more strongly prompted to respond to verbal communications by facing the direction from which they came and by facing the person they are communicating with. We think that this will add significantly to the fidelity associated with the learning activities we are planning. Non verbal communication can be facilitated by the gesture controls that learners can activate when communicating with other learners. How do they acknowledge understanding and receipt of a request, do they use non-verbal communications to emphasise their own verbal communications? By encouraging deliberate use of non-verbal communication in Wonderland, can we help support more effective communication within real world settings? Within the health care sector, practitioners are required to record every aspect of the care they are associated with, to follow protocols, and use proformas. Written communication skills are therefore essential. Using the Open Office word application within Wonderland, we can encourage learners to collaboratively complete care plans, patient assessment forms, and observations charts as well as access policy documents, just as they would in the real world. If we can enable access to Wonderland from within a Trust either by deploying behind their own firewall or by providing access to a world hosted elsewhere, then hospitals could have a very powerful tool with which to train their staff to use the systems that they are legally required to use and are judged against in the real world. In addition to the above, Wonderland allows teachers to open up a fully functioning Firefox browser. Whatever one student views in the browser is viewed by all other students co-located in the same space. We believe that this application on its own adds incredible value to our virtual world learning scenarios. If we look at virtual world technology as a simulation technology, then it is impossible to simulate the real world without enabling learners to access the web in their virtual world. From a pedagogic perspective, we can use the browser to transfer any web-based content into a trigger for collaborative learning, all within a 3D immersive space! For example, as an adjunct to our virtual worlds work we have developed a wide range of online patient simulations using software known as Virtual Case Creator (VCC). With VCC simulations, learners find problems, solve problems, and make decisions. One aim of our project is to explore how effective VCC learning is if students collaborate in-world as they access the VCC simulations using the web browser. One more feature of Wonderland that attracted us to this platform is its telephony integration. So many referrals within the health care sector take place over the phone. Nurses have to communicate patient information via telephone in order to persuade doctors to see their patients, for example. So important is effective telephone communication that in health care we have communication protocols to help ensure that staff can bundle and convey information as effectively and efficiently as possible. Within Wonderland, our students will assess a patient and then make a phone referral in-world to a phone in the real world. If their referral is effective they will persuade a doctor in the real world to attend in-world. How cool is that!! One of Wonderland’s unique selling points is the utility it affords teachers. By this I mean the ease with which scenarios can be created. Using the drag and drop feature, images, 3D models, and PDF’s can be dragged from a desktop into the world. A great example of this is the Wound Care learning activity we set up in 20 minutes. We simply dragged and dropped some wound images into world, dragged in a PDF document with information about wound care practice, (which automatically opened in its own viewer), added some care plans and an assessment chart for students to complete collaboratively and then added a poster with guidance for the learners. For a little extra context, we dragged and dropped in some models from the Google 3D Warehouse or from our own Wonderland inventory. Hey Presto!!! With no scripting or modeling required, we created a rich, student-led, activity-focused learning scenario. There are lots of other reasons why Wonderland seems such an attractive choice for teachers and trainers including, authentication, 100% Java, being free (yes that’s right, free!). I already stand the risk of being accused of blog hogging, so I need to quickly move to a close! Our COMSLIVE Project aim is to design a communication skills Wonderland environment and assess the extent to which this fosters real world change within our students as they engage within our high fidelity simulation centre learning activities. We are also exploring how scalable Wonderland set up is in terms of the number of worlds we can run concurrently, the number of scenarios in a world, and the number of avatars in a scenario. This is all looking good at the moment as we conduct a series of stress tests. In common with most Faculties of Health, we have high student numbers. There are 3000 student nurses in one course alone. The project is funded by the Joint Information Services Committee with a significant additional contribution by the University. We have also partnered with Sandwell and West Birmingham NHS Trust and Middlesex University. More information on COMSLIVE can be found at the JISC project website and at the Birmingham City University project website (very nascent). For more information please feel free to drop me a line. Due to our recent “organizational changes,” I never got a chance to write a blog post about the fun and interesting community test event on January 28th, but you can see snapshots from the event on our new Project Wonderland Facebook page. At that event, we heard an update from University of Oregon researchers Kathryn Aten & Taryn Stanko, and we learned more about the scripting module from Morris Ford. Our last presenter, Ryan Babiuch, known as “jagwire” on the Wonderland forum, demonstrated a new particle capability. Ryan is a developer on the iSocial project and an undergraduate at the University of Missouri studying Computer Science and Information Technology. He has been a developer on the iSocial project since before the stable release of Wonderland 0.4. In today’s guest blog post, Ryan describes the Particle Capability that he created and shows some examples. One of the aspects of computer graphics that I’ve always found interesting is the notion of special effects driven by particle systems. Upon test driving the Marbelous module, I immediately recognized the particle effects on the marble. The marble emitted a red glow as it traveled down the track towards its destination. I had to know how it worked, why it did what it did, and if I could do it differently. After a bit of trying, I discovered it was quite easy to add a particle system programatically to a cell, but that wasn’t enough. Why couldn’t one add it to any cell at runtime? I was able to develop a cell capability which would allow particle style effects to any rendered cell. 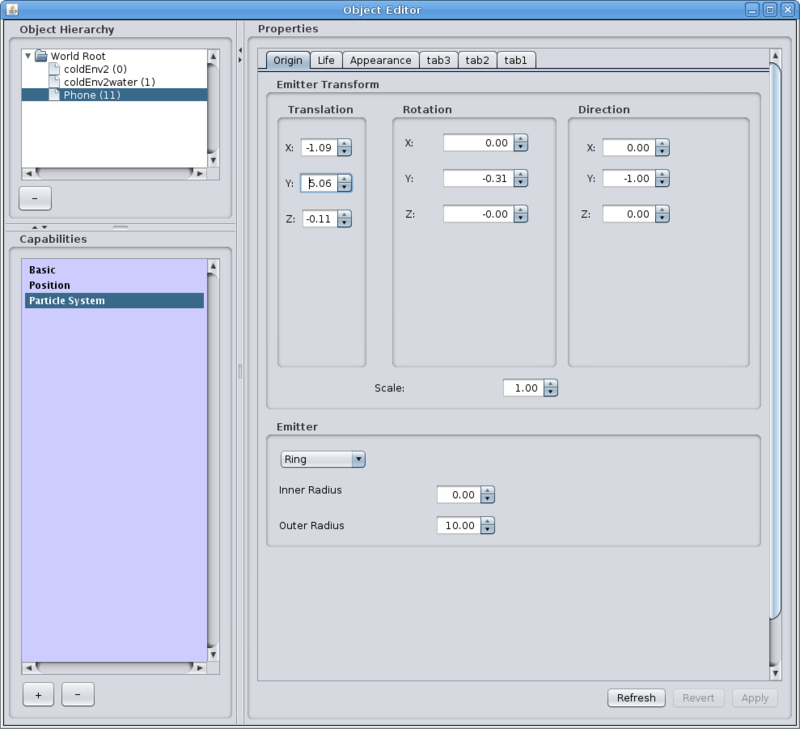 After installing the Particle System Capability module, the Particle Capability can be added to an object (cell) by opening the Object Editor window and clicking on the add (+) button found on the Capabilities panel. The default particle system automatically appears in the world and the user will be presented with a set of properties to manipulate and configure the visual effects for that particular object. Any other additional objects in a world can also take advantage of their own particle capabilities. To get this effect, you must change settings in three different panels. All settings were tweaked a bit to make the effect look the way it should. The settings are a bit loose as every effect is different based on a certain amount of randomness. Believe it or not, I applied the snow to the phone as well. The idea with the snow is to invert the direction of emission from up to down (-1 on the y-axis) and then I raised the starting position sufficiently high enough above the avatar’s head, as depicted in the snow settings screenshot. In its current state, the capability is rather primitive. The system as a whole has basic configurability including changing colors, timing, speed, as well as position, rotation, and size. 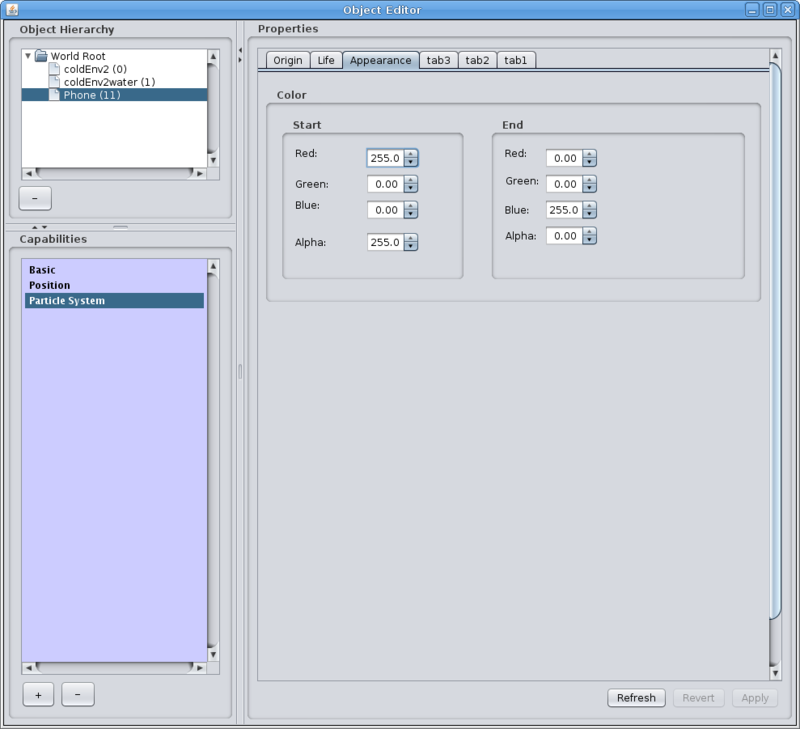 The properties interface still needs some polish and better organization. Finally, the current shape of each particle is a plain circle. Configurable shape of the particles. Configurable shape of the emitters, or source of the particles. Configurable layers of particles to give the illusion of multiple of effects at once. Configurable environmental influences such as swarming and gravity for better natural simulations. Built in environmental settings for a world as a whole for weather simulations. 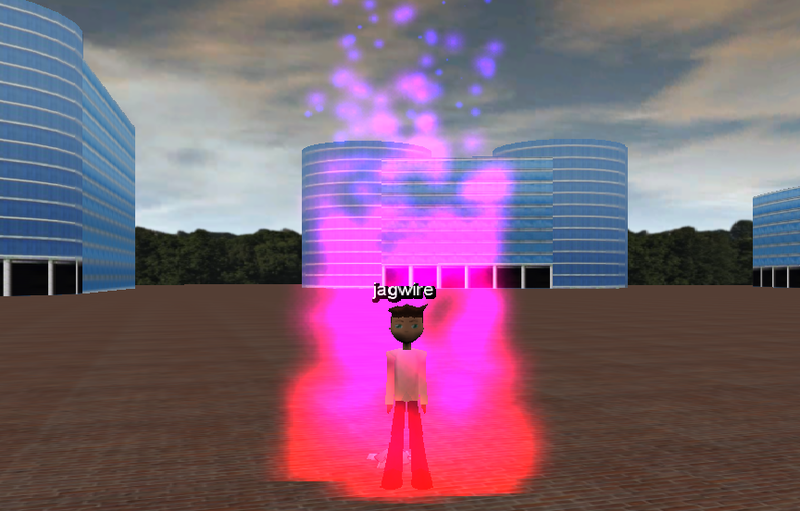 The ability to add particle effects to one’s avatar. As you experiment with the Particle Capability, please send me feedback and be sure to post your screenshots on the Wonderland Facebook photos page along with the settings you used to create the effect. Inspiration comes from all kinds of places. The latest module in the Project Wonderland Module Warehouse was inspired by two events: Jordan’s tooltip component and the +Spaces EU Project. If you’ve been following the news on the Project Wonderland web site, you’ll have seen an announcement of the +Spaces (“Positive Spaces”) EU project. 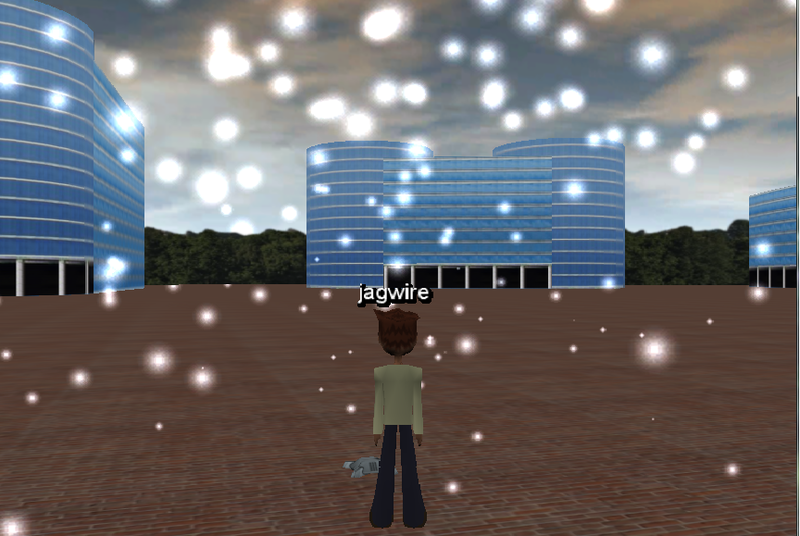 One of the goals of the project is to enable interoperability between Project Wonderland and OpenSim. I’m not a big Second Life user and I’ve never used OpenSim, so I thought it was time to take a look at how to develop for OpenSim. 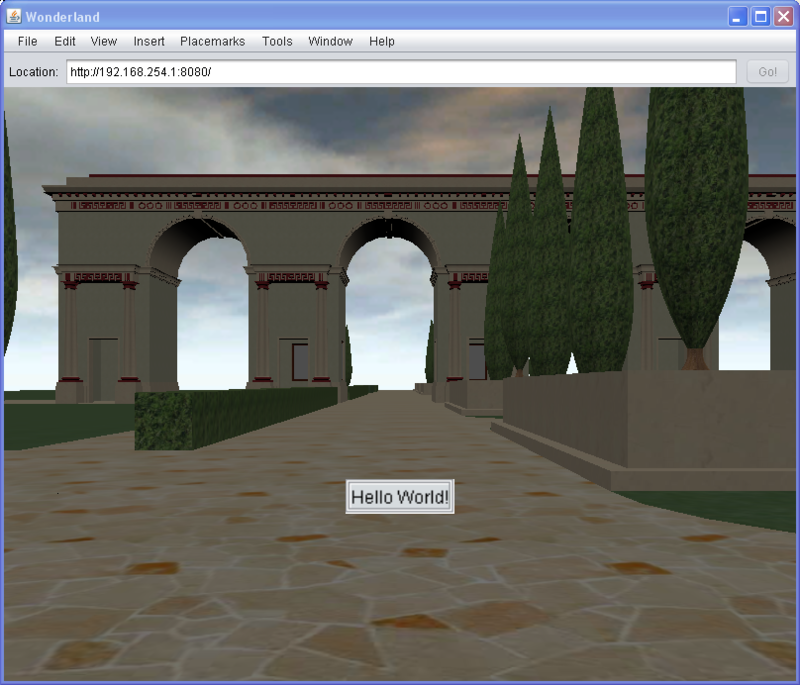 As with most developer introductions, OpenSim offers a nice “Hello World!” example–which led me to wonder how hard it would be to easily add text to a Project Wonderland world. At about the same time, Jordan released his tooltip component and it struck me that it would be cool if it was a proper object, not just a component. Of course, one of the benefits of developing in Java is that you get access to millions of lines of Java code and libraries that you can incorporate into your software. So it is with Jordan’s tooltip–it uses a Swing JLabel that can incorporate HTML. So, how about a Hello World example for Project Wonderland? Easy… just download the Poster module from the Warehouse. Once installed, you can select “Poster” from the Insert Object dialogue to get a Hell0 World poster. You can use more or less any HTML, but there are a few restrictions due to Swing. So, now you’ve got an object into which you can write any text, or insert anything that can be rendered via HTML. 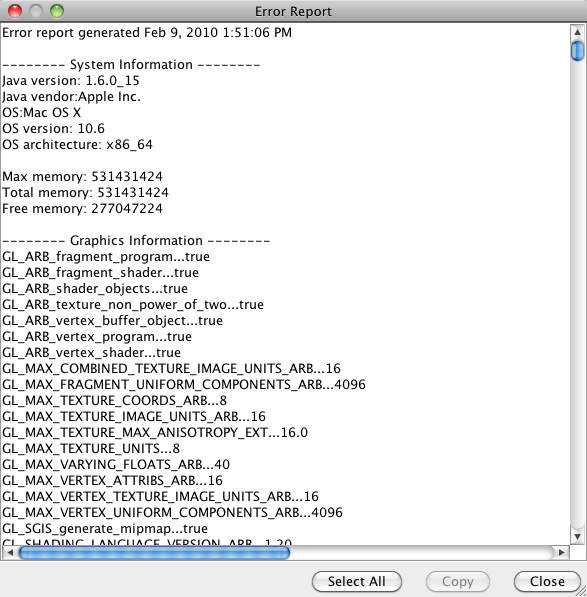 But there’s more… because it’s a first-class object in Project Wonderland it can also have capabilities applied to it. For example, a clickable-link, or audio. 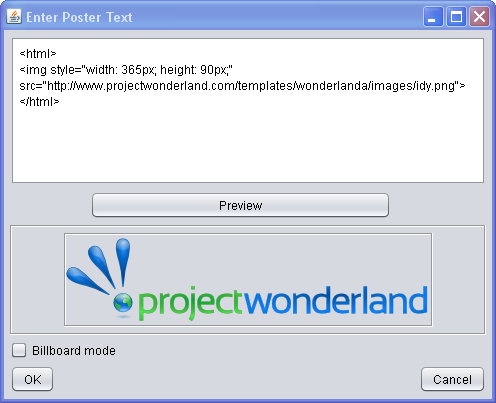 We are pleased to announce that the Project Wonderland v0.5 Preview 3 release is now available. This incremental release represents a major improvement in the overall stability of the Wonderland platform. We have fixed over 115 bugs in the system. Some highlights include fixes to improve Collada loading, stabilize shared applications, better support Intel graphics cards, and reduce server load with multiple clients. Wonderland 0.5 preview 3 also contains a new version of the Glassfish v3 embedded web server. This released version of Glassfish should improve the stability and performance of the Wonderland web server, including the security systems and asset repository. This has also allowed us to remove several Wonderland-specific workarounds in the previous version of the web server. Going forward, we will be able to use more of the web server features — including full support for Java EE 6 — to improve the web services associated with a Wonderland server. The Audio Volume window allows you to adjust your microphone and headset volumes. In particular, you can use the microphone volume meter to determine if your audio input is loud enough for others to hear. If your volume is set to a good level, the indicator should register half-way up the bar while you are speaking. You can also mute and unmute your audio by clicking on the microphone icon. The second image above illustrates how the display appears if your microphone is set to mute. You will also see square brackets appear around your name over your avatar’s head while on mute. 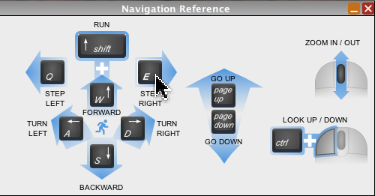 The navigation reference window provides a guide to Wonderland navigation keys. You can also use all of the buttons except for Zoom and Look Up / Down to move your avatar. This feature is handy for navigating when you have control of a shared application. When users encounter problems running Wonderland, the best way to troubleshoot the problem is to show the Java Console. Prior to this release, user’s had to manually configure their system to show this console. 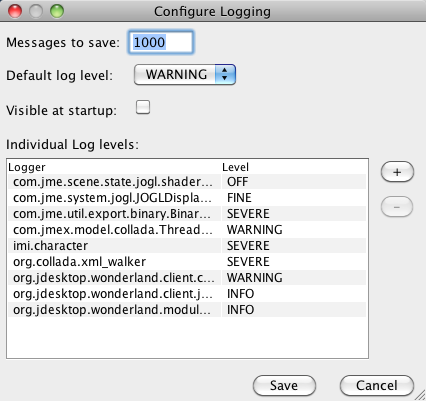 The Error Log command removes that requirement and allows users to open a Wonderland-specific version of the Java Console, called the Log Viewer. When a problem occurs, the user may click on the “Error Report…” button to generate a report with valuable debugging information. Using the “Select All” button, users can copy the Error Report text and paste it into an email message or forum post for the development team to analyze. 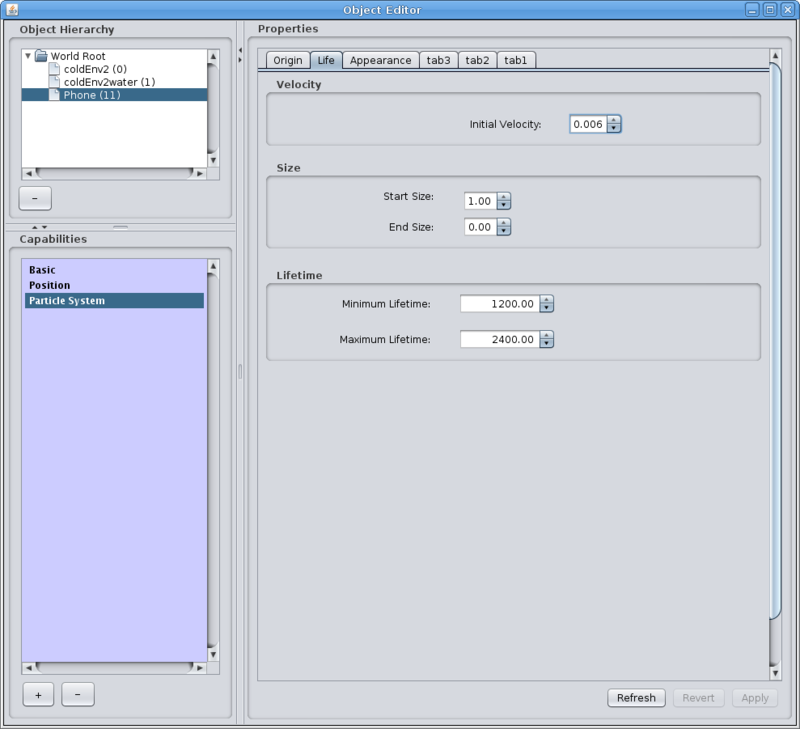 If more information is required, the user may be asked to change some of the configuration settings, by clicking on the “Configure…” button in the main Log Viewer window. When Google Earth (.kmz) files are dropped into the Wonderland window, the user will now see a brief message at the top of their Wonderland window if any errors are generated during the import process. 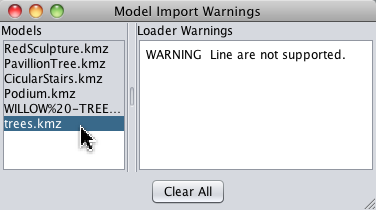 If this warning appears, selecting “Model Import Errors…” from the Window menu will allow you to browse through all of the models that generated import errors and view the specific error or warning messages that were generated. 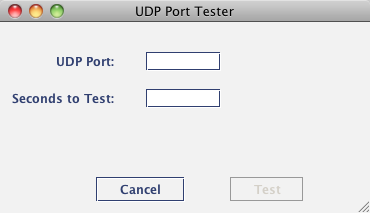 If audio is not working on a Wonderland server, it is often the case that a firewall is blocking the audio traffic, which uses a “UDP Port.” This advanced feature, intended primarily for system administrators, is useful for testing if the UDP port you have configured for Wonderland use is accessible. Thanks to our community members, Wonderland is now available in French, German, Swiss German, Spanish, and Chinese. If you haven’t updated Wonderland in a while, download Preview 3 and take it for a test drive. We think you’ll enjoy the new features. Also, don’t forget to check out the new Wonderland Module Warehouse where you can find modules that enhance Wonderland in new and interesting ways. Welcome to the new home of Wonderblog, the blog for news, events, and technical information about Project Wonderland. Use the links on the right to update your RSS feeds. You will find that many of the images in the archive are missing. Please be patient while we work to add these all back in. If you would like to submit a guest blog post, please email text, images and/or video links to nicoley @ dev.java.net. I will work with you on editing the article and I am also happy to discuss blog post ideas ahead of time. I would also love to change the blog banner image from time to time with community contributions. If you would like your Wonderland image considered, send a screenshot of 750 x 140 pixels with space in the middle for the blog name. A collage of screenshots would probably work as well. Be sure to also send an explanation of the image. This one is from the community test on January 28th. You are currently browsing the Wonderblog blog archives for February, 2010.